and LIPM.04 /TIPM.04 approaches. The TAPR protocol users we re willing to implement an interface based on the recommendations which would come out of the meeting. The differences we re resolved and led to the unanimous adoption of a subset- of an internationally recognized link level protocol (specifically it is called ANSI X3.66 ADCCP-HDLC BA Class, with options 2, 4, 7, 8, & 11). Why is this important? First, this link level protocol allows two AMICON ground stations to construct a packet pipeline. This same protocol can be used between two stations in a terrestrial backbone net. The same protocol can also be us ed for terminal-to-terminal connections, whether direct or via a simplex packet repeater. It represents only a slight extension of the CCITT X.25 LAPB link level protocol. And finally, it does not restrict future development of ISO Level 3 virtual circuit or datagram protocols. PID	Protocol Identification byte for information frames. Frames to be repeated by a local area network simplex packet repeater also contain a third address field following the FMCALL field. This third field is the callsign of the repeater. More details on this protocol will be published in the revised AX.25 specification document by WB4JFI et al. 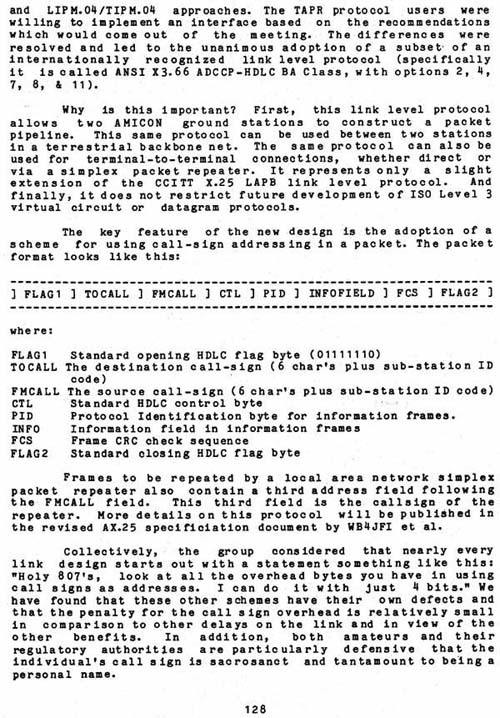 Collectively, the group considered that nearly every link design starts out with a statement something like this: "Holy 807's, look at all the overhead bytes you have in using call signs as addresses. I.can do it with just 4 bits." We have found that these other schemes have their own defects and that the penalty for the call sign overhead is relatively small in comparison to other delays on the link and in view of the other benefits. In addition, both amateurs and their regulatory authorities are particularly defensive that the individual's call sign is sacrosanct and tantamount to being a personal name.